T-shirts are great and tote bags. Just not pink in color. Love coffee mugs. I really like bookmarks, magnets, and clothing items because they’re so useful. I also like but dislike the little booklets with the first couple chapters of an author’s book, because it always has me craving more, which, I guess, is the whole point. Lol. 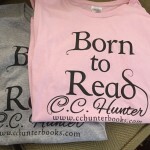 One of the parts of bookish swag that I love the most is the overall theme. 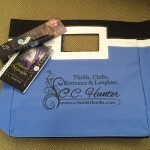 Being a book nerd at heart I’m always filled with joy at the sight of a tote bag, bookmark, pin, etc. Not only do I gain personal pleasure in having these bookish swags on me, but also honored to be able to wear them out and find people who share similar tastes. I really like bags and bookmarks because they are the most practical things, and something that’s very easy to find use for, but pens, as well as t-shirts are also really neat. Something that I think would be a good idea is a book sleeve with a quote from the book or the cover of the book printed on it. Honestly I love all the swag. I mean as a book lover, if you get swag from your favorite author you freak out and love it no matter what it is. 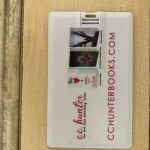 The swag you can wear, like a t-shirt or a bracelet or a pin helps you share with others what your favorite books are about. It’s a conversation starter. But I would honestly love any swag I get. It’s something to treasure because my favorite author sent it to me. Bookmarks and bags are always my favorite things because I will definitely use them, but to be honest, anything related to books that I love and my favorite author, I’d love to receive. I think a book sleeve with a quote or the cover of a book on it would be something really neat! I love everything that you have shown. I am a total geek for books. Reading is my all time favorite pastimes. I also love the t-shirts. I would wear that in a heartbeat. Most of all, I love that bracelet that you showed, and wondered if I could buy that outright. Thank you for all the amazing books that you write for us to read. I think it’s awesome I would love it even more if there was a shadow falls t shirt that would be awesome, and I can sport off my favorite books. your books are probably the first and only books I actually read and finished, thanks to my aunt Katherine Bonine introducing me to them I love love love them. Hi C.C. my name is Belinda Ortiz I just wanted to let you know my aunt bought me the first shadow falls and I read it and loved it, I ended up buying all the books and reading all of them, my next step is to read dellas story my aunt keeps telling me good things and I can’t wait to start them. I really love the give away bags and I think if you add a shadow falls t shirt it will make it even more awesome haha. Your books are the first series of books I actually read and finished. also me and my aunt were talking about that you should make your shadow falls series into a show with Netflix, and the mood with the books sends me a vampire diary’s and secret circle kinda vibe. you are amazing I love your books can’t wait to read more and if you read this thank you for taking your time to read me :). I love bookmarks and totebags because I get a lot of use out of them, but to be honest, I really enjoy all book related items! Something that I think would be really cool is a book sleeve with a quote from the book or the cover of a book on it! Love totes, pens, magnets, and anything I can show off so other people ask who you are Andi can tell them all about your awesome books!!!! Bookmarks seem to be the one thing everyone mentions. I am not picky. I like anything some of my favorites would be totes or some type of bag or pocket purse. Pens love pens. Shirts are cool. I really love the book charm you did for This Heart of Mine. I am generally happy to win anything from my favorite authors. Your the only one who does this and promotes their books . Bookmarks, charms with pictures of the actusl books on them, and pens are my favorite. however, when it comes to swags from amazing authors, then any are the best! 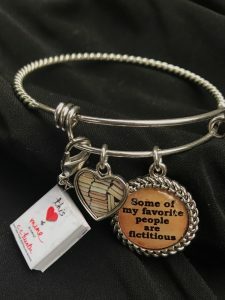 I love pens and paper, charm keychains or bracelets, and I have won a T-shirt before and I like them especially with fun sayings. I really love all kinds of swag but that’s my favorite. I like anything really. 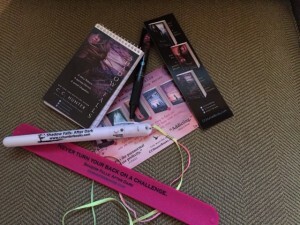 it is so fun to get any swag but, tote bag and t-shirts and bookmarks are always fun to get. I am new to your books, but I am a huge fan. I have loved all 7 that I have read and will be going to the library tomorrow for the rest of the Shadow Falls. 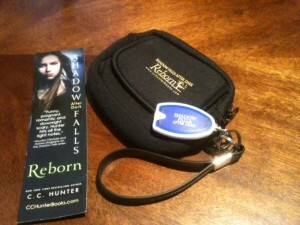 As for book swag, any bracelets or keychains that are book related. Love it!!!!! 2. Sweatshirt (always love a good sweatshirt!!) maybe saying shadow falls? Or have books on it? Personally, I like swag that I can see and use every day. People get excited about swag especially if it comes from someone they love or product that they really enjoy, such as amazing books. I love collecting pins/buttons! Tote bags are always a win, especially since having kids. There’s always 50+ things I need to take with me that won’t fit in a diaper bag. Pens that write really well and notepads. I think notepads might be my favorite type of swag. I’m always using them to jot down lists and notes, and I love having notepads with a bookish theme (really any notepad, haha).